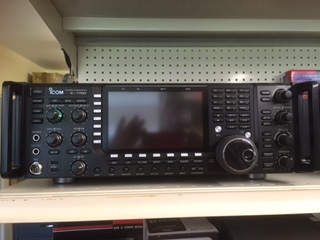 This is a lovely example of the Icom IC-7700. It comes boxed and includes Icom IC-SM20 microphone and ACK-595U Keyboard. The Icom IC-7700 was designed from the start to be the ultimate contest transceiver. It employs the latest technology to give you the competitive edge. Two independent DSP units (of the same type used in the famous IC-7800) are built in: one for the transmitter & receiver and one for the spectrum display. You will enjoy a +40dBm 3rd order intercept point and ultra wide dynamic range. There is an automatic tracking preselector to reject out-of-band interference. The newly designed push-pull MOS-FET amplifiers work with 48VDC, providing a powerful 200W of output power at full duty cycle with low IMD in all bands. Sixty meter operation is also supported. There is even a built-in digital voice recorder and voice synthesizer. Four types of scanning are available. The 7 inch diagonal wide color TFT LCD, 800x480 pixel display is dazzling. The front panel has two USB ports (for optional USB PC keyboards and USB cards). The rear panel offers a host of I/O connections including an SP DIF IN/OUT, BNC Transverter, Ethernet jack and VGA monitor jack.